- G+D Mobile Security, Inc.
LAS VEGAS, Jan. 3, 2017 /PRNewswire/ -- Helping more consumers do multiple loads of laundry at the same time, LG Electronics (LG) has expanded the compatibility of its award-winning LG SideKick™ – the industry-first "mini" washing machine that installs in the footprint of a traditional laundry pedestal. At CES® 2017, LG will showcase the compatibility of the LG SideKick with both LG front-load washers and now, for the first time, with LG dryers – delivering a truly flexible and versatile laundry solution. 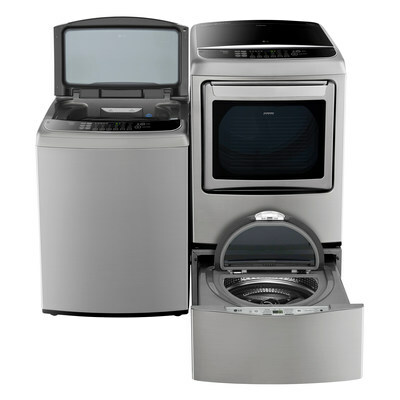 Compatible with every new LG front-load washer, as well as nearly all LG front-load models manufactured since 2009, the LG SideKick can now can be placed underneath the dryer of LG top-load laundry pairs featuring LG's unique front control panel – expanding availability of the time-saving innovation to consumers who prefer a top-load washer. LG offers consumers the ultimate in flexibility when it comes to laundry. With the LG SideKick, users can do multiple loads of laundry at the same time or tackle smaller loads that are a big deal separately. Now, the expanded compatibility of LG SideKick enables consumers to design a laundry solution that meets their daily needs – whether that's upgrading their existing LG laundry system to include the LG SideKick or purchasing one along with their choice of LG's leading washer or dryer models with advanced features like mega capacity, LG TurboWash® with steam saving 30 minutes per load* or LG Smart ThinQ™ which allows users to monitor and control their laundry via the smartphone app. "Since unveiling the first LG SideKick mini washer at CES 2015, there's been an overwhelmingly positive response from consumers who've benefited from the time and effort saved thanks to being able to wash multiple loads at the same time," said David VanderWaal, vice president of marketing, LG Electronics USA. "Expanding the compatibility of the LG SideKick to include both LG washers and dryers reinforces LG's commitment to delivering innovation that improves the daily lives of all consumers – including those seeking a more convenient way of doing laundry." Designed with the consumer in mind, the LG Sidekick was cleverly built as a pedestal drawer to raise the main washer for easy access when loading and unloading clothes, particularly easing the burden of large, heavy loads. Thanks to LG's easy front-control panel on select LG dryers, users can readily access the controls in the front and enjoy its sleek, modern look. The LG SideKick mini washer helps consumers divide and conquer their laundry thanks to advanced technology pioneered by LG. It offers six distinct wash cycles, making it an ideal laundry solution for washing small, custom-care laundry loads including special care items such as intimates, delicates and active wear. Despite its compact size, the LG SideKick can wash approximately three to four pounds of laundry per cycle with its one cubic foot of capacity, saving time, energy and water. It can also operate independently from or simultaneously with an LG washer or dryer and allows users to start or stop a cycle on either washer without interrupting the other. VanderWaal said the popularity of the LG SideKick, coupled with LG's overall focus on home appliance innovation and product quality, has raised the company's profile as a leading, trusted brand among American consumers. For example, LG Electronics scored the number one spot in a U.S. customer satisfaction survey among home appliance brands, according to the American Customer Satisfaction Index® (ACSI). The findings come from ACSI's 2016 surveys of randomly chosen customers who are asked to evaluate their experiences with recently purchased household appliances. ** LG's front-load washing machines have also been named the most reliable among all major appliance brands by a leading U.S. consumer publication. To learn more about the technology behind tackling multiple loads of laundry at once, please visit LGSideKick.com. LG's expanded lineup of compatible washer and dryers will be on display at CES 2017 from Jan. 5-8 in Booth #11100 in Central Hall of the Las Vegas Convention Center. "LG" and the LG logo are trademarks of LG Corp. Other company and product names may be trademarks of their respective owners. *Compared to other LG top load washers without TurboWash. Based on AHAM-HLW-1-2010 test protocol. Cotton / Normal or comparable cycle at default settings, 8 lb. loads. Excludes quick wash or comparable cycles intended for small, lightly soiled loads only. **The American Customer Satisfaction Index (ACSI) is a national economic indicator of customer evaluations of the quality of products and services available to household consumers in the United States. More information on ACSI can be found at www.theacsi.org. Named 4K Ultra HD Partner for CES 2017, LG Electronics USA, Inc., based in Englewood Cliffs, N.J., is the North American subsidiary of LG Electronics, Inc., a $49 billion global force and technology leader in home appliances, consumer electronics and mobile communications. LG Electronics, a proud 2016 ENERGY STAR Partner of the Year, sells a range of stylish and innovative home appliances, home entertainment products, mobile phones, commercial displays, air conditioning systems and solar energy solutions in the United States, all under LG's "Life's Good" marketing theme. 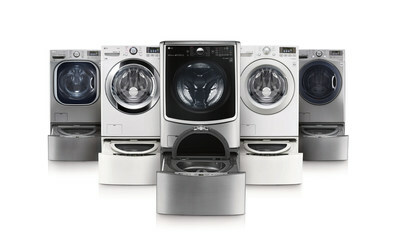 For more news and information on LG Electronics, please visit www.LG.com.